Distributed in more than 140 countries, Moët & Chandon is considered the most appreciated Champagne in the world. This imperial champagne Moët & Chandon is at once vibrant, generous and seductive. It goes well with seafood and white meat. Since 1743, Moët & Chandon has always made bold decisions to conquer the world and create the largest Champagne house. Distributed in more than 140 countries, Moët & Chandon is considered the most appreciated Champagne in the world. Moët & Chandon actively participated in the creation of Moët-Hennessy then LVMH which she is now part of. Moët & Chandon owns the largest estate and is also the largest buyer of grapes in the Champagne region. The quality, size and diversity of French vineyards and supplies are essential to maintain the consistency of non-vintage wines and the originality of vintage wines. 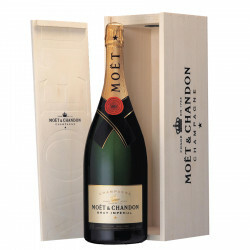 The style of Moët & Chandon is distinguished by its bright fruit, seductive palate and elegant maturity. The artisan spirit that Moët & Chandon possesses inspires the approach of viticulture and winemaking through adaptability, precision and a sense of detail. As a leader, Moët & Chandon is particularly involved in preserving the environment and responsible consumption. Greatness and generosity are the characteristics of Moët & Chandon. With a bold heritage and out of the ordinary, his hospitality is second nature. It is a reflection of a deep commitment to sharing the magic of his Champagne. The house offers a diverse range of unique wines, to satisfy every occasion, every desire, every palate to "share the magic of Champagne with the world".